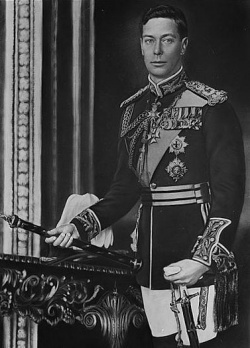 George VI (Albert Frederick Arthur George Windsor) became King of the United Kingdom and the British Dominions on December 11, 1936 after his older brother, Edward VIII abdicated the throne. His Majesty George VI reigned as king through WWII, and is known for boosting national moral by refusing to leave London for safer lodging. In the years after WWII his health began to deteriorate, perhaps due to a combination of stress and excessive smoking. The 1939 royal tour of Canada by King George VI and Queen Elizabeth was undertaken in the build-up to World War II as a way to emphasise the independence of the Dominion from Britain. The visit lasted from May 17 to June 15, covering every Canadian province, the Dominion of Newfoundland, and a few days in the United States. The life of George VI has been the subject of much public scrutiny, most recently in The King's Speech, a 2010 film that won the Academy Award for Best Picture. 1 Did William Branham see King George VI in Vancouver? 2 Did William Branham pray for King George VI? Did William Branham see King George VI in Vancouver? William Branham tells a story of how he was in Vancouver with Ern Baxter when King George VI was visiting Canada. Did this happen? King George VI and his Queen stopped in Vancouver on May 29, 1939. However, it is virtually impossible that William Branham was in Vancouver on that day. William Branham's healing meeting started in the late 1940's and Ern Baxter did not become William Branham's campaign manager until some time after the start of the healing campaigns. Also, in the first telling of the story, it is clear that William Branham was not there but the story was related to him by Ern Baxter. Later on, William Branham appears to have appropriated the story and told it on the basis that he was there. Why did William Branham tell a story that was clearly not true? Did William Branham pray for King George VI? William Branham stated that he met and prayed for King George VI in 1950, although there appears to be no public record of this. William Branham also stated that the King was healed from multiple sclerosis at that time. There is no record that King George VI had this disease, although he did have arteriosclerosis. The King was seen publicly in May 1950 which was shortly have William Branham visited England. However, the King's health was reported to have deteriorated significantly after that and he died February 6, 1952. A close friend of King George VI's personal secretary was in attendance at William Branham's meetings in Fort Wayne, Indiana. It was during these meetings that this friend witnessed the healing of a man who had been bedridden with multiple sclerosis for 10 years. King George VI apparently learned about William Branham through this secretary, who relayed to him this story. "Brother Branham, I understand through my secretary that one of his friends was healed of multiple sclerosis. I desire of you to come pray for me, that our Lord Jesus will heal me." Feeling it was not the Lord's will to travel to England at that time, William Branham replied that he would not be able to come, but would pray for the King from America, which he did. A while later, a second cablegram arrived from King George VI, again requesting William Branham to come and pray for him. In early April 1950, while en-route to a campaign in Finland, William Branham stated that he was able to finally meet and pray for King George VI in person and that the King was restored to health at that time, and played 28 holes of golf the next day. There are certainly no public records that William Branham visited King George VI. William Branham's indicates that his personal records contained a letter of thanks from King George VI for his prayers. It is surprising that, given the amount of questions that have arisen on this website and others about the credibility of William Branham, the Branham family has not come forward with this letter as evidence as support. While the public was informed of the King's health problems, there was never been any indication from any source that the King suffered from multiple sclerosis. Perhaps William Branham mixed up arteriosclerosis with multiple sclerosis. However, William Branham's followers claim that his discernment was exact. Why would William Branham pray for him for multiple sclerosis when he had been diagnosed in 1948 with severe heart disease and it was this disease which resulted in his death in 1952? What is striking is that William Branham pronounced the king healed, yet the King's health continued to deteriorate. This was most noticeable just after William Branham prayed for him, from one of his last public appearances that he made in early May 1950. Why would William Branham pronounce him healed, when King George VI died in early 1952? The press often reported every outing of the King. Why would William Branham say that King George played 28 holes of golf the next day, while there is no public record of this event? The King had suffered from a duodenal ulcer, for which he had an operation in November 1917. In 1948 the public was advised that King George VI had a form of arteriosclerosis (hardening of the arteries) called Buerger's Disease, after which the King severely reduced his public appearances. Certain nerves to his legs were also severed in order to free him of some pain in standing. In 1949, the King suffered an arterial blockage in his right leg, which was operated on in March of that year. King George VI slowly began to regain his strength, then quietly passed away in his sleep on February 8, 1952 as the result of coronary thrombosis. A little girl taught us a lesson some time ago, when the famous King George, of who I had the privilege of praying for, when the Lord healed him of multiple sclerosis… And he was visiting a Canadian city, and all the schools turned out. And they taken the Canadian flag and went to the street corners. And when the king passed by… I shall never forget the expression on my manager's face, Mr. Ern Baxter, a Canadian. And when the king passed by, suffering at the time with stomach trouble and multiple sclerosis, and he stood up or set up by the side of his beautiful queen in a blue garment… Then I seen this two hundred and forty pound man, that when the carriage turned the corner, the man threw his hands to his face and wept. And he said, "Think, the king is passing by." And then…?… "Oh, what will it be someday when the King of kings passes by." There was a little girl who was found after the streets was cleared. She was standing over by the side of a telegraph pole with her little hands up against the pole, weeping, sobbing her little heart out. And the teacher trying to find the child… She had her little Canadian flag across her shoulder and was weeping. And the lady said, the teacher, "Dear, why do you weep? Did you not wave your flag to the king to show that you were a patriotic?" She said, "Yes, teacher, I waved my flag." She said, "Then did you not see the king?" She said, "No, teacher, it wasn't that I did not see the king. I saw the king." She said, "Then why are you weeping?" She said, "The king did not see me." It reminds me of a little girl not long ago in Canada. Some years ago when I was over at Vancouver, the great late King George was a visiting Vancouver. And I was noticing the emotion upon my manager, Mr. Baxter, while he was watching the king and the queen as they rode by. And how she in her beautiful garment, and the king though suffering with multiple sclerosis, and also a stomach trouble, he set correct in his carriage and was speaking and bowing to his subjects, or the people, as he passed by. And Mr. Baxter, he said he stood and wept because the king was passing by. It was the first time he'd ever seen him, and it brought emotion to him just that moment, in the little view of the king passing by. I thought, "Oh, what will it be when our King of kings passes by…?… Just one glimpse of Him in glory when our journey is completed, these little cold nights in the theaters, and disappointments will just vanish like nothing then. 8 The schools turned out to see the king. And the—the teachers wanted to be patriotic, so they give each child a little flag, a little Canadian or British flag to wave as the king went by. And I like Jesus because that He notices every little thing that we do. You say, "Brother Branham…" Maybe I seen the man counting the collection. You might not have had but just a few pennies to put in the collection, but Jesus saw it. You might not… You say, "Well, I haven't done very much for Him." But whatever you've done, He saw it. The woman that put in a, just a few pennies in the collection, Jesus said she put in more than the rich did because of her tithing, she put all her living. No matter how little it is, how small and short our service will have to be, because of the weather and the condition, Jesus will see our sincerity. And I'm sure He will answer. 9 As I was speaking of the little girl, that all waved their little flags… There was an incident happen there that has always stuck with my heart. That was, one little fellow, just a little tiny tot, packing her little flag on her shoulder, she went down to wave at the king when he passed by. And when all of the crowd had cleared up, the little fellow failed to show up with the rest of the little girls. So the teacher was alarmed, and out on the streets she went to find the little girl. And the little girl was found with her little head leaning against a telegraph pole, weeping. So the teacher said to her, "Why are you weeping? And did you not see the king? Did you not wave your flag?" She said, "Yes, teacher, I waved my flag just like the rest of them waved." Said, "Did you not see the king?" Said, "Yes, teacher, I saw the king." Well said, "Then why do you weep?" She… The little girl replied, and said, "I saw the king, but I was so little, the king didn't see me." Up in our neighboring nation, Canada, some time ago, my good friend, Brother Baxter from Vancouver, we were up there at the visit of King George. That was before he had been healed with the multiple sclerosis and his ulcerated stomach. And I certainly had a respect for the man. And when he came down through the street that day, yet suffering, they said, intense pain from both his sclerosis and his ulcer, he set straight, bowing to his subjects as he passed along the street. And I noticed my friend, when the king passed by, he just chuckled out and wept. He said, "Brother Branham, think, there is the king, and look at the queen in her beautiful gown." And I thought, "If that would make a Canadian feel that good" in which I respect, and think that's fine, "and if he could feel that way, as a Canadian, when the King George and the queen passed by, what will it be when we see Jesus, our King, go by?" 18 The schools all turned out, and the teachers gave the little children some little British flags to wave at the king as he passed by. Sometime ago I was standing in Vancouver, British Colombia, and the King George of England had come over to visit Canada. And he was making his way down along the street in the carriage, and his beautiful queen setting by him… And Mr. Baxter, one of my associates, he was weeping, because he said, "Just think, Brother Branham, our king passes by." And I thought, "If that would make a Canadian weep because King George, the honorable king, was passing by, what will it be when Jesus passes by—He is the King of Kings—with His beautiful Bride, the church?" Like in Canada, I was standing there with my good friend, Dr. Ern Baxter, who used to be my platform man; very fine, eloquent man. And when… King George, who I had the privilege of praying for, you know, when he was healed with the multiple sclerosis. When he and his wife passed down the street that day in Vancouver there, as they went down the street there. She was in her beautiful blue dress. And the king himself setting up there, trying to set straight, hurting and sick, his ulcers bothering him. But yet he knowed he was the king, so he bowed to the people. And when he went by, Ern and I listened to it. He… Ern just turned his head and started crying. He couldn't hold it. He said, "Brother Branham, my king is passing by." And I was called to King George of England, to pray for him with those multiple sclerosis. I understand by the radio today, that he's got some kind of a lung trouble now. And he was a friend to the king's private secretary, and through there King George of England sent word to me. I have his statements and have his letters of his fields and every... To come pray for him of multiple sclerosis, and so I couldn't go up that time. So I just wired back and told the king that I would pray for him here, that God would hear here just the same as he would over there. And so, then another telegram come through and wanted me to come on over immediately. Later when I went to England, over there, to see him, and the Lord healed him. He was--couldn't even stand up over five minutes at a time, and he... I believe the second day he played eighteen holes of golf, and never was bothered with it no more until the very day he died. And it was through this healing of this man out of the wheelchair, that I was called to pray for King George of England, which he was a--a friend to his private secretary that sent for, pray for him. And the king was healed with multiple sclerosis. And he could only, I believe stand up so long at a time, or something. I don't remember. I've got it in writing at home with his seal on it. King George had stomach trouble, and he had multiple sclerosis. That's the one that sent for me to pray for him. And the Lord healed him of it. King George of England with multiple sclerosis, when I went over and prayed for him. Couldn't even set but just a few minutes at a time. Next day, played twenty-eight holes of golf. And as you know that when I went there and prayed for King George when he had multiple sclerosis and he was healed instantly; the next day he played eighteen holes of golf, and he couldn't even set up for just a few minutes at a time. Some time ago the King George that I had the privilege of praying for, as you know, that had the multiple sclerosis. The Lord healed him. King George, who I had the privilege of praying for, you know, when he was healed with the multiple sclerosis. Thinking about how little and insignificant, seeing that many of my Canadian friends sitting here. I remember I was in Canada when the King George... The one I had the privilege of going praying for, when he was healed, with that multiple sclerosis; he was suffering that day, from the sclerosis, and also he had a stomach trouble, an ulcer; as many of you Canadians know, and Americans, also. This page was last edited on 22 May 2017, at 05:18.